A host of free events will take place across North Tipperary to celebrate Culture Night on Friday 21st September next. On this night, locals and visitors across the island of Ireland will enjoy a night of free entertainment. Culture Night will kick off in North Tipperary with a Community Reading of Ulysses by James Joyce beginning at 10.30am in The Source Arts Centre, Thurles. This special marathon reading in celebration of Culture Night will involve 18 voluntary groups reading a chapter of Ulysses and will continue until noon on the 22nd September. Play Youth Theatre, Nenagh will host free drop in Youth Theatre Workshop at 3.30pm in Nenagh Library for teenagers aged between 13 – 17 years. Leaders Joanne & Aoife will guide participants on a journey of games, improvisations, drama and much more! At 4.00pm, Kevin Whelan will guide walkers on a unique tour of Nenagh which will take in the Norman Settlements, Medieval times, The Famine and Nenagh’s development as a modern thriving market town. The meeting point for the tour is Nenagh Arts Centre and the walk will end with a tour of the newly refurbished Nenagh Castle. At 5.30pm in the Civic Offices, Nenagh, Cllr. Michael O’Meara, Mayor, North Tipperary County Council will officially launch Culture Night Celebrations in North Tipperary with the opening of the “What Will You See” Group Exhibition. This Group Exhibition showcases the range of creative practice taking place in North Tipperary and will give viewers the opportunity to experience the wealth of Artistic talent living amongst us. Entertainment will be provided by the Nenagh Players and other local arts groups. In Nenagh Heritage Centre, learn about the varied history of the building, visit the condemned cells, the execution area and follow in the footsteps of prisoners as the Heritage Centre staff lead you on a free tour of the building from 7.00pm. If you’re interested in tracing your roots, Genealogist Nora O’Meara which will assist you in learning more about your past. This talk will take place in the Governor’s House at 7.00pm. Cloughjordan Culture night kicks off from 6.00pm and events will include an Arts Trail, Visions of Cloughjordan – an exhibition of photos of Cloughjordan through the ages, Kids story time with Nigel Quinlan, Pop-Up Heritage Museum in the Cloughjordan Heritage Group Office, staged readings by Cloughjordan Drama Group, Poetry by Cloughjordan Writers Group, Singing workshops with Liz Powell and traditional music sessions. Quay Arts in Ballina will remain open until 7.00pm. Visitors will have the opportunity to view recent works by Beatte Gillson and Helene Moran, an exhibition of contrasting styles. Beatte explores the abstract while Helene develops her interest in character studies. The Source Arts Centre in Thurles presents “ Sowing The Seeds of Dance”, a show and tell performance which is the culmination of a series of dance workshops held during September in The Source Arts Centre with Fluxusdance. Local participants will perform their own dances based on the theme of gaelic games at 7.00pm. Marie O’Reilly and Friends present “The Spirit Moves!” – Inspirational songs, poems and readings in St. Mary’s Church of Ireland, Thurles at 7.30pm. Culture Night in Nenagh will conclude with a traditional Irish music session “Coel Gaelach” presented by Conradh na Gaeilge in Rocky’s beginning at 9.30pm. All musicians are invited to attend. Culture Night is a national initiative co-ordinated by Temple Bar Cultural Trust and supported by the Department of Arts, Heritage and the Gaeltacht in partnership with North Tipperary County Council. 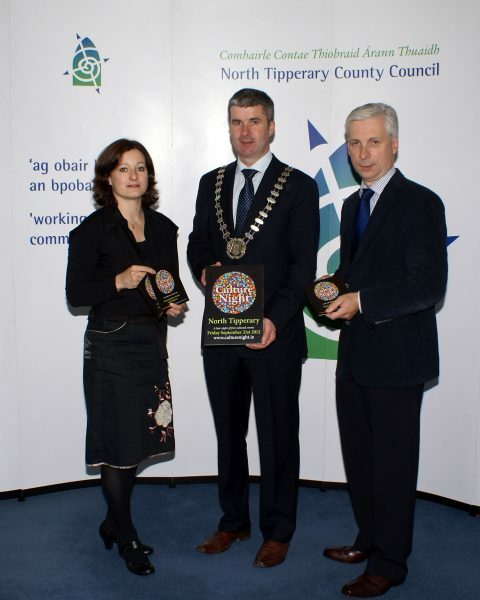 North Tipperary County Council would like to thank all those involved in Culture Night in North Tipperary. For further details or for a Culture Night Brochure, please contact the Arts Office, North Tipperary County Council, Civic Offices, Nenagh at 067- 44860 or via email to rosemary.gleeson@northtippcoco.ie. Further details are also available from our website www.tipperarynorth.ie/arts and from participating venues.